While I understand that this entry may only apply to my brothers in Sigma Pi Fraternity, their families, and the friends of our fraternity, I think it also serves as a good discussion of why certain tax-deductible donations are better than others. Below, I’m going to argue that a donation to the Sigma Pi Educational Foundation‘s Chapter Educational Fund program is a great option for fraternity alumni because the dollars are more flexible and they can go further over a longer period of time. Several years ago, the Sigma Pi Educational Foundation (the Foundation) started a program to create Chapter Educational Funds (CEF). Before we talk about what a CEF is and what it can do for you and your chapter, you should know that the Foundation is a 501c3 tax-exempt organization. This means that donations made to the Foundation are tax-deductible to the fullest extent of the law. In other words, if you write a check to the Foundation for $5, $50, or $5,000, then all of those funds can be list as charitable contributions when you or your accountant prepares your deductions for the tax year. Sigma Pi Fraternity (the Fraternity) and the Foundation have done a lot of research over the years. For the Foundation, that research was focused on what it could do to entice more of our 50,000+ living alumni to donate for the advancement of the Fraternity. In 2003, the Foundation commissioned a report from a third party group to ascertain – among other goals – whether it could raise significant funds from our alumni base to support national programs. The report gave the Foundation many results, including the fact that most alumni want to find a way to support their local chapter more so than the national organization. Several years later in 2010, the Foundation again studied what Sigma Pi alumni felt strongly about as it put together its strategic plan. During the focus groups and outreach in 2010 it was clear, again, that our alumni love Sigma Pi and would love for the Foundation to provide an option that allowed them to donate for the benefit of their local chapter. This finding would be one of the many outcomes in late 2011 when another third party group researched the prospects of raising significant funds to support national programs. The message is clear – Sigma Pi alumni are willing and able to donate to the Foundation. They prefer that those donations help their local chapters succeed. The Foundation has always welcomed those individual alumni or groups of alumni who seek to set up a scholarship to honor a living mentor or as a memorial to a brother who has passed away. In fact, the Foundation awards several national honorarium and memorial scholarships each year. Yet, the research showed that the Fraternity’s alumni wanted to donate to something more directly aligned with their local chapter. Thus was born the CEF program. The CEF program allows a group of local alumni – called a Local Advisory Committee (LAC) – to create a specific fund at the Foundation where money donated to that fund is used solely for the benefit of their local chapter. Like a traditional Foundation scholarship, a CEF can allow the LAC to award scholarships to members of their local chapter. Yet, a CEF is a more flexible tool to help the local chapter improve because of the other various uses of donated funds. In addition to scholarships, a CEF may provide fellowships for graduate members of a chapter to pursue advanced degrees or professional development programs. Any use that is academic or educational in nature is an allowable use of money donated to a CEF. In the recent past, CEFs have been used to provide full reimbursements of registration fees for undergraduates to attend Sigma Pi University (now called Sigma Pi UIFI). Similarly, CEFs have been used to provide full reimbursement of travel costs for undergraduates to attend the Mid-Year Leadership Conference as well as Sigma Pi University. On a more local level, CEFs have been used to pay for the event reservation fees and food costs for academic and leadership training breakfasts and luncheons hosted on-campus where instruction is provided by highly-qualified local alumni and/or invited guest speakers. In other words, if your chapter’s alumni want to host an annual brunch for your undergraduates where you can instruct the undergraduates on issues related to their academic and/or educational growth, then you can pay for the costs of that event through donations to your local CEF. A CEF can also be used to purchase academic or educational equipment for the chapter. What does that mean? Well, it means if your chapter owns a chapter house and there is space for a library or study area in the house, then funds donated to a CEF can be used to outfit that space with academic equipment (i.e. computers, software, and networking needs). The uses stated above are what can be achieved when money that you donate to your local CEF is granted (i.e. given away) to a specific cause. However, if you opt to keep the funds in the CEF (i.e. you’re not granting them away), then the flexibility of your CEF increases. In this option, money donated to a CEF can be used to provide a loan to the local chapter, alumni club, or housing corporation to make improvements to a chapter house. The breadth and scope of those improvements do not have the same academic and educational limitations as when money is granted from the CEF because in this instance, the money in the CEF isn’t being given away. Instead, an LAC may request a loan from its CEF for any housing-related reason including making immediate quality-of-life repairs to a chapter house, building an addition on to an existing chapter house, or even helping a chapter purchase a new house. In those scenarios where a loan is provided by your CEF, the LAC should expect a full underwriting and approval process – just like getting a loan from a local bank. Typically, interest will accrue on the loan at a rate agreed upon by the LAC and the Foundation and the CEF will have to pay an origination fee (which can be negotiated). Unlike a bank, however, it is typical for half of the interest that is paid by the borrower to be placed back into the chapter’s CEF and for the other half of the interest to be paid to the Foundation, which helps it operate (once the interest funds are put back into the CEF, they can be used for the same purposes noted above). Several Sigma Pi chapters around the country currently have loans outstanding from their CEFs with similar repayment terms. There are some other ins and outs that an alumnus or group of alumni need to know before opening a CEF, but those issues can be better discussed directly with the Foundation. What is important to understand is that if you want your chapter to have an annual scholarship or some academic fellowships, if you would like to see your chapter’s registration fees and travel costs to attend most national conferences fully reimbursed, or if you’d like to see your chapter receive a loan (where they’re actually getting a portion of the interest back!) to address housing issues, then you really should consider the Foundation’s CEF program. Last month, I gave a presentation about how to plan, perform, and follow-up on an award-winning ACE Project. The ACE Project is specific to Sigma Pi Fraternity and the presentation is really only relevant to Sigma Pi undergraduates and alumni volunteers who want to know more about this topic. Or, if you’re interested in listening to me give a presentation for a little over 30 minutes, then you’ll enjoy this video. I apologize in advance for the weak sound in the video – hopefully, you can adjust it on your end so it works well for you. My next filmed presentations for Sigma Pi Fraternity will be in February 2015. The two topics that I’m speaking on are Sigma Pi Fraternity in New Jersey and True Greek Leadership. It’s going to be a lot of fun! 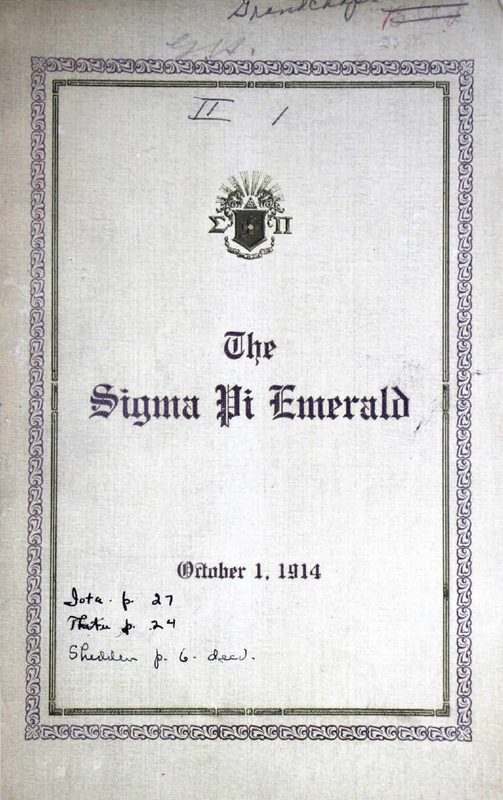 One hundred years ago today, Sigma Pi Fraternity published Volume II, Number 1 of The Emerald magazine. You can see the simple yet elegant cover of that one hundred year-old issue below. I believe that looking back at what was printed in The Emerald one hundred years ago helps bring some of the current conversations in the Greek world into a more focused perspective. The first thing that strikes me when I look at the one hundred year-old magazine is that the gentlemen who operated the Fraternity in 1914 had the foresight to charge a subscription fee! At the bottom of the cover page is a note that reads: “Subscription rates $1.00 per year in advance.” Over the years I’ve sat in on many conversations regarding the cost of producing The Emerald. Whenever the idea of charging a small annual fee for the magazine is brought up, it is shot down. Some argue that we promised our members that we wouldn’t charge them a subscription fee and others say that no one would pay it. Regardless of why we select not to charge a small subscription fee today, the initial operators of this fraternity were not afraid to charge each member a dollar for the privilege of receiving the national magazine. The next thing that strikes me about The Emerald is that they list the house address and contact information for every single chapter of Sigma Pi right in the beginning of the magazine. Of course, there were only 9 active chapters back then, but it’s still a nice touch! The Emerald begins to show some meat when we get to the Foreward. This line strikes me as relevant in the anti-fraternity, anti-male environment that many of our chapters operate in today: “It is our earnest wish that The Emerald may be effective in espousing the cause of the College Fraternity in general and of Sigma Pi in particular…” I wish that this was still a core focus area for our national organization. Sigma Pi Fraternity – and no national fraternity, for that matter – no longer makes it a basic cause to promote the virtues of college fraternity membership. Further and more specific to Sigma Pi, we do not do a good job of promoting our undergraduates’ incredible successes in mediums that have lasting cache. In other words, while we might tweet a congratulatory note or post an update on Facebook noting a job well done, we do not use our publications as methods of publicly promoting the many good works that are intrinsic to fraternity life. From time to time we print stories about successful Sigma Pi alumni in our national magazine, but we don’t take those stories to the masses. We don’t utilize our Fraternity-owned web assets (we have six different, official Sigma Pi blogs) as methods of regularly promoting the great value of membership in our fraternity. Do we promote the value of being a Sigma Pi or a member of a Greek organization every once in a while? Sure. Do we use these assets to promote Sigma Pi and Greek Life on a consistent, regular basis? No. The mindset of the early members of our Fraternity was that of dealing from a position of strength. They didn’t cower or bend at the first anti-fraternity accusation hurled in their direction. No! Instead, they believed that Sigma Pi “fills a distinct want and supplies the requirements of a definite need in the lives of our college boys.” This line from The Emerald comes from an editorial that was reprinted in the magazine and talked about the great success of a young Sigma Pi Fraternity as it worked to grow a strong reputation in the Greek world. I was struck by this short editorial because it speaks unabashedly about the virtue of fraternity membership. There is no silent apology or tone of regret that we even exist! One hundred years ago, fraternity men didn’t apologize for being men, for being masculine, or for recognizing the value of mentoring and one-on-one personal development that takes place within the walls of a chapter house. Today the fraternity world throws its collective hands in the air and says, “We can’t win!” when a grossly biased editorial or disgustingly negative article is written about us. There is no innate belief that we should vocally and/or forcefully stand up against attacks on our very existence. In place of that belief, we’ve promoted policies of placation to the loudest, angriest voices. Did you know that the Fraternity voted to implement a National Memorial Day of Sigma Pi on the first Sunday of May each year? The Emerald says that “on this day each man should wear a small piece of crêpe under his pin, and services will be held in all Chapter houses of the Fraternity, honoring the beloved dead.” Seems like a nice tradition that we’ve forgotten and should reinstitute. Province Archon visits to their chapters used to be paid for by the “Grand Treasury” and if they couldn’t afford it, then the province would have to chip in for the cost of the visit. Of course, this was before the traveling consultant program was implemented, so Province Archons must have provided the bulk of on-site training to the undergraduates. At the Fourth Biennial Convocation it was decided that “the proper place for the badge of the Fraternity… is directly over the heart.” Just in case any of you were wondering – that’s what was decided by the first members of Sigma Pi! There is an article titled On Solid Ground that includes a line which I believe is a forerunner of Sigma Pi Fraternity’s current ACE Project program. That line is, “fraternities are interested in and working for the aggrandizement of their alma mater and not for the purpose of exalting the fraternity above the college as a whole.” How about that? The spirit of the ACE Project uncovered one hundred years ago in our national magazine! Of course, I’m not sure if these words were actually written by a Sigma Pi brother (if I had to guess, I would say that they were not written by a Sigma Pi, but instead included as a larger report that was reprinted in The Emerald), but it’s still pretty impressive that the spirit of the ACE Project was promoted by Sigma Pi Fraternity before any of us were even born. A final comment from Volume II, Number 1 of The Emerald that seems relevant to what many of us face in today’s anti-masculinity, anti-fraternity student life environment. There is a line in the magazine that says: “It is our conviction that when we trim the situation down to the psychology of the matter we have before us merely the battle of the ‘outs’ against the ‘ins’; that it is, in short, simple, common, every day, human nature.” The core of this statement is the possession of an inner knowledge that we should all have as members of Sigma Pi Fraternity. And that knowledge is that we are going to be attacked by those on the outside simply because they’re on the outside looking in. Undergraduates have many hokey sayings about fraternity life – one of which is that from the outside looking in, you can never understand it, but from the inside looking out, you can never explain it. That is the position that we find ourselves in today. The vocal, anti-male minority that uses the biased media to publish negative outlooks on the future of fraternities are nothing more than those same “outs.” And they’re angry for many reasons, not the least of which is the life of pseudo-intellectual privilege that they’ve bastardized since the cultural revolution of the 1960s. That revolution promoted transparency above all else as it relates to large institutions. And the calls for transparency mostly took place on college campuses. But on those same campuses we – as fraternity men – sit in the face of that transparency. We are members of a private boys’ club which irritates those “outs” because they don’t know what we “ins” know. What they have are anecdotal accounts of the worst elements of fraternity life that they desperately try to explode into vast generalizations to define all of us. And what do we have as a response? One hundred years ago, the first brothers of Sigma Pi Fraternity would have brushed off the accusations of the “outs” by publicly ridiculing the use of extreme examples to define the whole. Fast forward to today and instead of calling out extremists and zealots, we’ve been reduced to taking personal offense to negative comments from the “outs” when we should be hitting them back even harder. In one hundred years’ time, Greek leaders have gone from a group of men who took pride in openly promoting the virtues of fraternity membership to a group of men who mostly walk in lockstep with a student life industry that is more concerned with extricating itself from any risks or any possible offenses than it is concerned with introducing college students to scientific, biological reality. I hope that Sigma Pi can lead the way for the Greek world and turn the tide back in the direction of being inherently proud of fraternity membership… and soon. Here’s hoping that you enjoyed last week’s return of the Start the Weekend Right Link Series. And just like last week I’ve got a bunch of great links for you to consider to begin this weekend with all of the knowledge that you need to know and, of course, to spread around to your friends. Just think, you’ll be the most impressive person at this weekend’s BBQ or football game because your mind will be packed full of the great content that I have to share with you today! Granted, you’ll have to read these links in order to be the one with all of the knowledge. But today is Friday and you’ve worked hard all week – so kick back, relax, and fill your mind with some good reading. Before we get to the links this week I again recommend signing up for a free Feedly account. I get absolutely no kickback for promoting Feedly, but I’m so appreciative of their product being the best RSS reader on the market that I encourage everyone to use it. If you’re using another RSS aggregator, please consider following JerseySmarts.com at http://www.jerseysmarts.com/feed/. If you’re already on Feedly, then you can follow us by clicking here. And away we go! Back in January 2003, I was a college senior who just rolled off of two straight years of being the President of my fraternity. During those two years we did a lot of really great, transformational things to help improve the chapter and all of that experience was floating around my head needing an outlet. Our volunteer regional director decided to host a regional development workshop for the undergraduates from around New Jersey right at my home chapter and he asked me to speak. One of the major points in my presentation during that workshop was the concept that is covered in this article. My spin on it was that members of our fraternity shouldn’t try to be the “cool” kid in the chapter; they should strive to be the most active, productive member of the chapter! Give this article a read – I love the message! You may remember a long while ago when I wrote about the Princeton University study suggesting that an income of $75,000 was all that was needed to be happy. The study suggested that after you earn $75,000 per year, earning more money doesn’t necessarily add more happiness. Well, that study has now been adjusted on a state-by-state level and, as the rest of my fellow New Jerseyans already know, everything is more expensive in New Jersey. In the great Garden State, our “happiness” number is $95,700 per year… so get to work, everyone! In keeping with the theme of money, the guys over at Wall Street Playboys put together a great article about how you should view cash. There’s even a short guest appearance by the Oracle himself, Warren Buffet. In particular, I like their perspective on cash flow being king and time equaling money. Those of you who are not involved in education may not be aware that grade school, high school, and college classes all started this week. In recognition of the college classes starting this week I’m posting this link which I found incredibly thought-provoking. The American Conservative looks at what the problem is with the Ivy League admissions process and proposes some suggestions to improve the system. If you have an interest in higher education and truly finding ways to improve the system for coming generations, then I think you want to read this article. This one is short and sweet. The writer of Patriactionary points out a journalistic mistake that makes this English major shake his head in exasperation. I read a small group of optimistic, empowering websites that focus on giving young men the type of inspiration that they need to become their best selves. One of my favorite sites in this group is Bold & Determined and I think that this short video and the accompanying commentary are a great example why I rank this site so highly on my list. I encourage everyone, especially the younger guys who might be reading this series, to check out Bold & Determined. This is a great article. With school back in session this week I’ve noticed some of the New Jersey-centric online newspapers publishing their all-too-common anti-education reform bashing articles. In fact, one of them posted an op-ed from a far left professor who bashed all of the reform movements that are popular in New Jersey (popular because they work) and the guy didn’t give a single fact to back his perspective. Not one fact. Talking about good, high quality education in New Jersey can be very frustrating, but this article attempts to get to the core of the issue. What makes a good teacher great? This article gives four great indicators of a great teacher. This article starts out with a guy recounting how he was tossed out of his home as a kid for coming out as gay. He then talks about being homeless before he tells a story about nearly being beaten to death. Of course, this wouldn’t be something for The Saturday Evening Post to publish unless there was a newsworthy twist. And that twist is that the guy who was nearly killed coincidentally wound up meeting – and working with – the guy who perpetrated the attack. While I wasn’t as moved by this article as I’m sure some folks were when they read it, I was interested enough in the story and the weird way that coincidences tend to work out to share the link here for your consideration.